Prickly Plants â Turning the thorn IN your side into the thorn AT your side. 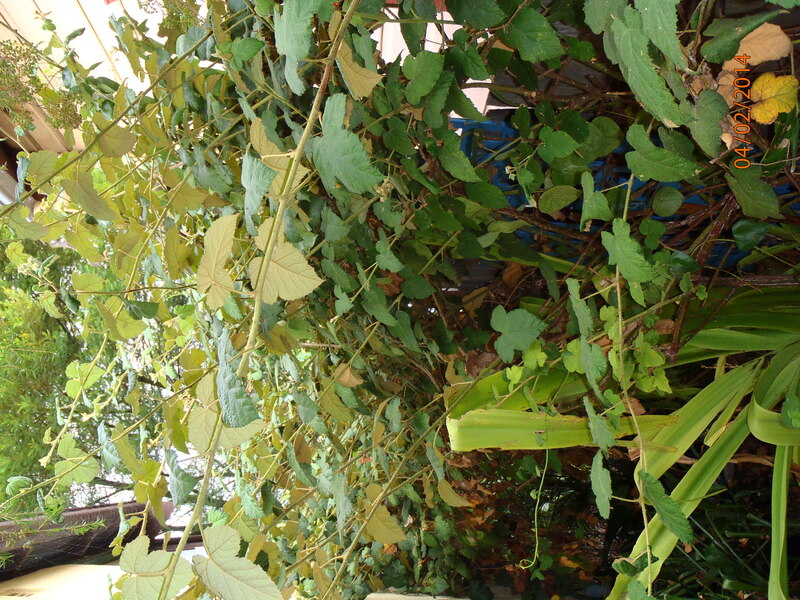 Due to the discomfort large mammals like humans experience from thorny plants, the numbers of such plants incorporated into gardens have declined. This is particularly the case around suburbia where there is less remnant bushland and general growing space. There are a number of thorny fruiting plants out there and in addition to their excellent produce, the thorns themselves can be used to advantage in a number of ways. Best not to locate them adjacent to a thoroughfare where they’re most likely to interfere with passers by, but to use their inherent qualities for other garden functions. Ie; Habitat/natural pest control, security, food and tools. In the wild, many small birds rely on the protection of thorny natives to raise their young and rest at night. Being petite, there are many predators to deal with and this protection is sorely needed. The importance of maintaining this habitat is even greater in suburbia due to the large populations of roaming cats. Small birds are generally insectivorous and provide a huge benefit in the way of natural pest control. If you’re sick of drunk people jumping your fence to sleep the night on your verandah or if you just want to bolster security around your house. Criminals hate getting spiked like the rest of us so some raspberries beneath an insecure window, for example, can be a cheap and efficient way to dissuade unwanted entry. I have effectively used a native Raspberry (Rubus moluccans) to create a productive security barrier between houses where previously the occasional fleeing miscreant would make their escape! Some cacti spines have been used historically as sewing needles through Central and Southern America. Golden Barrel Cacti are a good species for this as the needles are large and curved, particularly at adulthood. Some of the most interesting possibilities including a few native bushfood species; Natal Plum, Finger Limes, Bush Lemon (and other Citrus wild-types), Berry Brambles (ie; Raspberries, Blackberries, Loganberries, Boysenberries etc. 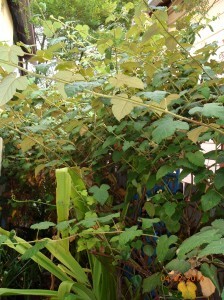 ), Cockspur Thorn, Tree Violet, Rose-hip Roses. There are also some useful local wattles that are quite prickly and can be incorporated in secuity plantings as nitrogen-fixing nurse trees/shrubs. 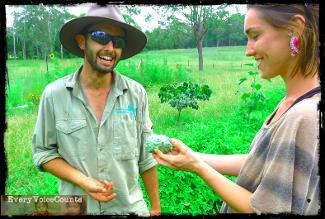 EVC Mandalong Permaculture – Grow your green thumb. Tree Frog Permaculture in partnership with Every Voice Counts is going to be running regular Saturday morning educational tours of the new Demonstration Permaculture Garden in Mandalong (NSW). The idea is to provide an avenue for affordable education on garden sustainability in such a way that you can ‘choose your own adventure’ so to speak. Not everyone have the same time constraints, level of understanding or points of interest so smaller group size and half-day weekend slots allow for a specifically tailored service. Ask questions, bring your own specific garden problems or green a ‘black thumb’. Anything is possible so get started on, or continue down, the path to garden sustainability! 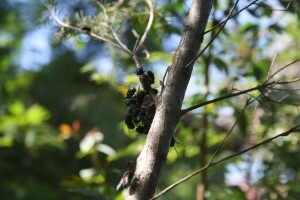 I was wandering the garden a couple of weeks ago and looking across the yard to a young Melaleuca, noticed shiny black blotches on one of the lower branches. As I approached it became apparent they were clusters of large shiny black flies gathering on patches of blood and a half-mouse carcass suspended at around eye height. Grotesque! But how on earth did a mouse get up there in that condition?! That is some death-crawl… but no… some other force is at work in the garden. A good force too considering that where there is food, there are rodents. Mice and rats can be clever, breed rapidly, and are a continual pest for organic food growers. 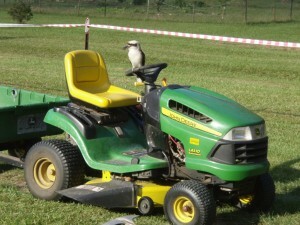 One of many organic control methods is to encourage predatory native animals to the garden. Birds seem to be the most available native predators of rats and mice and by pruning the lower branches on trees to allow perching with a clear view of possible ‘rodent runs’ you create the perfect predator perch. Owls and hawks will do the job, hawks more from the sky, but I think the culprit in my instance is one or more Butcher Birds. Butcher Birds are a clever native carnivore and earned their name through a penchant to skewer their prey on thorns or pointy sticks on tree branches for easy eating or temporary storage. They are a smaller bird thus cannot usually swallow their prey whole so it makes sense that they would find a safe platform for their butchery. They are also smart enough to learn of holes or regular rodent spots and stake them out for decent periods of time. Brutal but a self-perpetuating and low input method for garden rodent control. Thanks Butcher Birds! If I were to describe some of the basic tenets of one of the world’s great philosophies, would you be able to guess which one I was talking about? Let’s see. Impermanent.Â No matter what you think, feel, say or do you can be absolutely certain things will change, grow, decay and die. Impersonal.Â Every animal is driven by instinct to learn the lessons key to their survival and humans are no different. As babies we spend most of our waking hours testing and retesting the natural law of cause and effect because at that age we already understand the importance of that law. We then go on to forget that lesson and begin to take life personally. But life itself remains the same – one long and infinitely complex sequence of consequences that would be entirely predictable if only we had an infinite brain. Not inherently satisfactory.Â There is no thing that exists that will cause us to feel perfectly and finally satisfied, forever. Nothing we can have, do, think, say, believe, feel or sense has the characteristic of being perfectly and permanently satisfactory. Now that we understand the nature of life, what is the purpose of life? To open to our connection to the Source using a most unlikely and fortunate event â this human form at this exact point in the history of the universe. The ‘Source’ is the creative, reproductive energy that forms, shapes and subsumes all manifestations of life and fuels the never ending process of cause and effect. Call it whatever you want, it won’t get offended. After all it is impermanent, not inherently satisfying and, yes, completely impersonal. So what is the path that leads to that ultimate purpose? Â You must start, and keep going. That’s about the sum of it, though most of us like to talk about what starting really means and how we can do this thing called ‘keep going’. Because of this many philosophies have developed rules and guidelines and steps and anecdotes that we can continually read and talk about, become expert in and teach courses on. Mostly this all holds us back from the important business of starting and keeping going but sometimes it inspires us to start and keep going. So have you worked out which philosophy we are talking about yet? Buddhism? Tantra? Taoism? Permaculture? Christianity? None of the above. This is an organic, homegrown philosophy for those environmentally conscious folk who like to know where their stuff comes from and what the production footprint was. And whether any humans, animals or ecosystems were tortured to bring the product to your plate. And best of all it is like one of those pick-your-own farms â you have the opportunity to try it out for yourself. Enlightenment in one page, complete with a free trial? Where can I get it?! But wait… this is going to take a lot of practice. And that little detail at the end of the instructions: keep going. That’s the one that trips most people up. This philosophy is not for the faint of heart. It is… Lantanaism. Remember that the aim is to be open to the Source. Being open to the Source means that we are fully in the flow of life. In order to open something, and in order for anything to flow we first need to clear away the blocks and defilements. So pick a space that you would like to clear of the defilement commonly known as Lantana. Ask yourself who you do this for. If not for yourself, then for whom? And why. If you work diligently you will begin to see results. If you are lazy and slipshod you will become frustrated by your lack of progress. If you cut the defilements at their base they will grow back. If you pull them out by their roots and then make the environment inhospitable for them they will not grow back. If you let your defilements grow unhindered, so that they flower and seed and flourish, they will impact upon those around you, and those around them so that your defilements will become a blight on all of life for all of life is one. If you carefully remove all of your defilements the space you have cleared will be a thing of beauty and inspiration to all those around you and those around them so that your work will be a blessing to all of life for all of life is one. If you find it very difficult to uproot your defilements then you are working against the law of nature. Try a different way, try again in different circumstances, use tools or ask for help. The more you practice the more expert you will become. With equanimity approach each defilement. It is what it is, the result of cause and effect like all else. React to each defilement with neither craving nor aversion. Don’t let a sense of triumph or pride guide you, equally don’t be disheartened or overwhelmed by the task. Devote yourself to your practice and submit to the process without hopes or fears of the outcome. The seed of a defilement, if planted and tended, can only grow into a defilement. If you wish to grow something more useful, then plant and tend the seeds of something more useful. A defilement that has been left to grow old, deep-rooted and sprawling, that has entangled with other defilements and wrapped around all in its way will be more difficult to remove than one discovered at the earliest stages. Remain in the present, aware and mindful of the true reality of the moment. A sustained and discerning awareness will allow you to spot the seed of a defilement before it germinates. A sustained and discerning awareness will also develop in you a perception of all that remains around, beyond, beneath, above and within the defilements. All that remains when the defilements are gone is all that was there before and all that you plant according to the universal law of cause and effect. Cause and effect. If you wish to be truly free of defilements then not only must you remove all your defilements, you must be careful not to plant or tend any more. If your friends insist on spreading defilements where you have worked to clear the space, then find wiser friends. But friends who help remove your defilements, help plant and tend more useful seeds and bring no further defilements to your space are one of life’s most precious gifts. Ask yourself, does this make sense to me? Do I see results? Is this the way to clear this space of defilements? Am I becoming more aligned with the Source, more in-tune with nature, more understanding of the natural laws and more expert at designing and implementing my own plan for this space? If yes, continue. If no, find another way. Define yourself not as Lantanaist or in any other way. Waste no time differentiating yourself from others or trying to convince another to walk the same path as you. Where the defilement called Lantana is unavailable to aid your practice then vast tracts of paramatta grass, fireweed, purple verbena, running bamboo, asparagus fern or any other endemic noxious weed will suffice. The easiest path is not always obvious. Defilements are most simply uprooted using an uphill motion. Pay careful attention to the nature of life represented within you for this is all you can truly experience; your mind, your emotions and your sensations or intuition. There you will find that thoughts and feelings and physical sensations come and go, are created by no-body and are not inherently satisfactory. The closer you look the more you will realise there is nothing to be found there, nothing to be held onto, nothing to be pushed away. Only the practice remains. Good luck with your practice. May the Lantana bow to your intention and through your great effort may the world be rid of all that defiles it. If you need advice on finding a local tract of weeds to work on Lachie is one of the great Masters of Lantanaism and could point you in the right direction. Neighbours throughout history have generally had strongly mutualistic relationships due to elements of co-reliance. Mutual help was often needed in a survival sense, ie; trading/sharing foodstuffs, tools, skills etc. As western society has modernised, increased prosperity and the availability of a welfare safety network have resulted in reduced neighbourly dependence. Also the balance between privacy and sociability between neighbours has seemingly shifted more towards privacy, where there seem to be increasing incidence of complete neighbour disconnect or a ‘shutting-off’ of neighbourly relations. Now, while neighbours might not be forced to maintain relationships or help each other through necessity (at least in the wealthier nations of the world), this does not mean there aren’t still many benefits to maintaining healthy neighbourly relationships. Following are some points and a couple of examples just from my experience. The edges of an ecosystem dont necessarily follow fence-lines or property boundaries. This can especially be applied in suburbia where an ecosystem is segmented into many adjacent properties. While each property is separated by fences, plants and animals don’t operate along human-defined boundaries. Thus, what happens in the other yards in your neighbourhood can still influence your own. A prime example of this is fruitfly; if people living nearby have fruitfly-prone fruit tree varieties (ie. 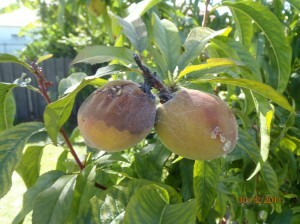 Stone fruits, loquats, apples etc) and fail to maintain them properly, a local population of fruit-fly is established. 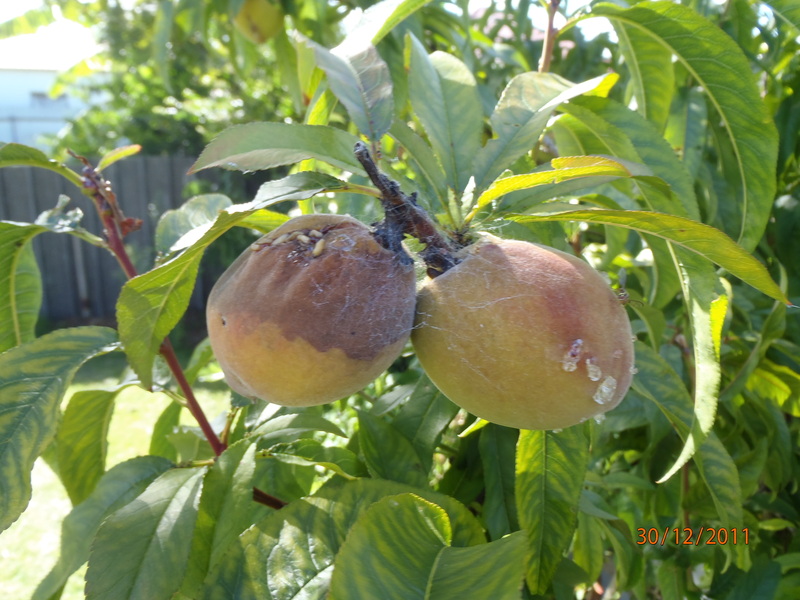 That population will then range and make it extra hard to minimise fruitfly impacts in your own crops. This can be applied to any ranging garden pest or weed. While soil-types and weather patterns may be similar within a suburb, a range of microclimates suitable for growing a great variety of different crops exist. In addition respective neighbours will have different wants, needs, and growing preferences, providing the neighbourhood with a wonderful variety of supplementary produce to share and trade. Another benefit to maintaining neighbourly relationships is the conservation of energy/material needs and recycling of waste. For example; one of my neighbours has a decent amount of lawn and finds the grass clippings fill his bin, leaving no room for other rubbish. I offered to take all of his clippings (I use them for compost) and now get them automatically each mow. We both feel the other is doing us the favour! One persons trash is another persons treasure, as the saying goes. With infrequently used items such as lawnmowers, just think of the potential invested energy saved if we could share one lawnmower per multiple households! In effect we are a super-organism, each of us cells making up this organism. If communication and co-operation is effective between ‘cells’ then our potential for acting together as an efficient and sustainable society is on the way to being realised. 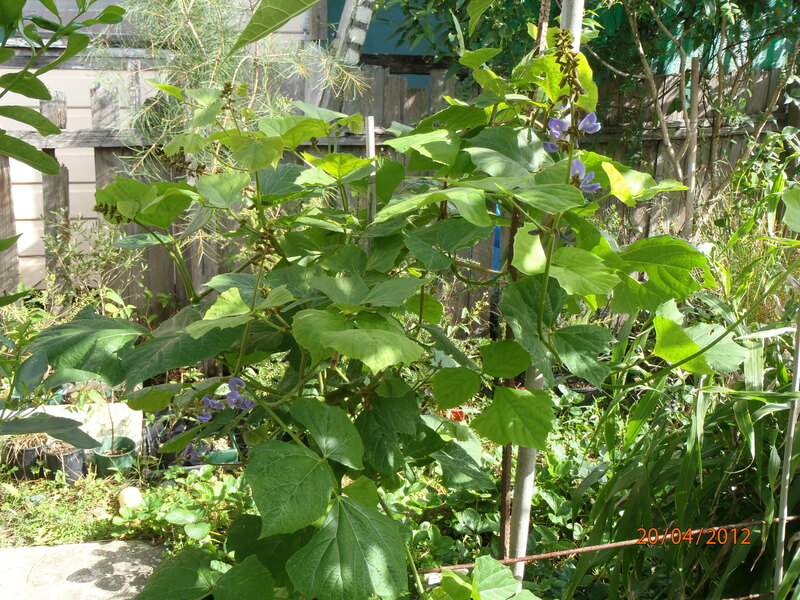 Yam Bean or Jicama â A tasty and versatile Permaculture crop. 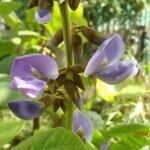 Originating in Central America, the Yam-Bean (Pachyrrhizus erosus) is a climbing perrenial plant of the legume family. The plant prefers warmer weather but will tolerate more temperate climates as far south as Sydney and Adelaide, temporarily dying back to its tubers over winter. 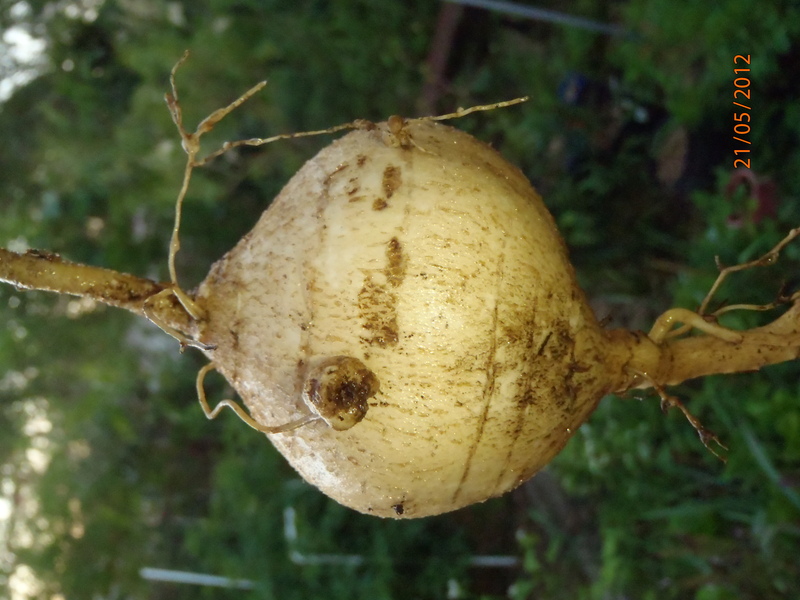 Each plant can produce up to 5 root-swellings or tubers beneath the soil surface, each of which can get to the size of a turnip but having a similar crisp texture to water chestnuts and have an apple-like taste eaten raw. The tubers store well and dont lose their crispness through cooking, making them a great addition sliced into stirfries or grated raw into a salad. Yam Bean tubers are a delicacy in Mexico, eaten by the slice sprinkled with lemon-juice, salt, pepper and chillies. YUM!!! The vegetable has even been adopted by American supermarkets as a top-selling specialty item! Yam Beans prefer light, well-drained, fertile soils and require a long growing season (~9 months) for the best tuber production. 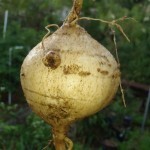 Tuber growth can also be enhanced by keeping vines cut short (to ~30cm) and pinching off flowers as they form. This way the plant puts all of its energy into the root system. 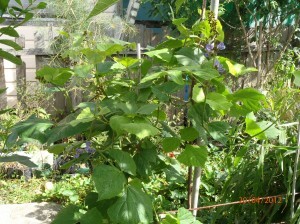 Propagating Yam Beans is possible via tuber or by seed. The seed stores quite easily and remains viable for a number of years. 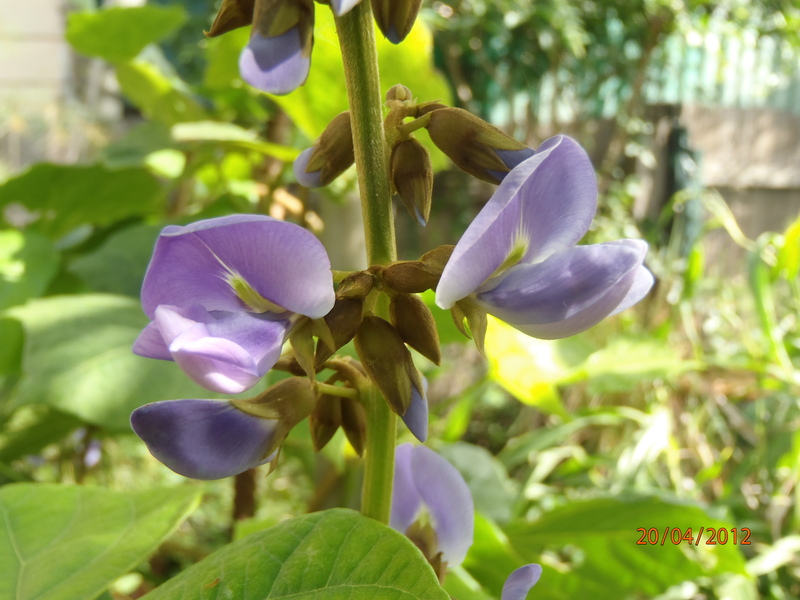 Legume â The Yam Bean has the ability to fix nitrogen meaning it can provide much of its own nutrients for growth, even a little extra for plants nearby. Try climbing it up corn for example. Natural source of an organic poison (Rotenone) â All parts of the plant above the soil; stems, leaves, flowers, seeds and seed-pods contain levels of the insecticide, pesticide and piscicide (fish poison) Rotenone (May also have some fungicidal properties.) NB: I recommend that people with young children be aware of this fact. Also, upper parts of the plant shouldn’t be fed to animals. Aethetic value – when left to flower, produce a showy display of large blue pea-flowers. We are holding a free sustainability workshop for homes and small businesses. Bring your questions and problems in the fields ofÂ Sustainable Timbers,Â Permaculture/organic gardening, Energy Efficiency, Passive Design,Â Home Sustainability, Land Management,Â Efficient and cost effective design solutions, flora and fauna, forest management,Â material selection, small business sustainability,Â water efficiency, hot water and home heating options etc. An additional 41 coal trains per day through Newcastle and Maitland will increase dust related health problems like asthma and other respiratory ailments as well as the increase in the accumulation of heavy metals such as Lead and Mercury in the local soils. These soil contaminants make it more difficult to use yards, parks and other urban spaces for local food growth. A waste considering most housing and development occur on some of the most arable soils (ie. The flat lands). Local food production is important in food security, augmenting the farm-grown supply of food and reducing transport energy costs. Prime agricultural land and fresh water supplies need to have priority over the accelerated expansion of coal exports if we are to accommodate a secure food supply for both our own and future generations. The 4th Coal Terminal would facilitate many more large coal mines (the equivalent of at least 15 ‘mega-pits’) in the Hunter and Liverpool Plains destroying much of this aforementioned prime agricultural land. The dramatically increased coal exports will then go on to provide at least another 15 coal-fired power plants around the world, continuing to fuel climate change emitting an additional 288 million tonnes of carbon pollution each year. As a first world country we have a responsibility to set a good example and start investing in alternative energy sources, namely the plethora of renewable energy sources we know can be improved and implemented. Kooragang Island, the proposed site of the 4th coal-loader, provides critical habitat for a number of Nationally threatened species including the Green and Golden Bell Frog and Australasian Bittern. Four species of migratory shorebirds listed under international conservation conventions use habitat owned by the National Parks service at the site which would be lost. In addition, a significant area of the only freshwater refuge in the Hunter estuary, ‘Deep Pond’ is proposed to be developed. This pond’s unique qualities and proximity to the Ramsar Wetlands means it provides irreplaceable habitat for at least 11 species of migratory bird recognised by international treaties. Because Kooragang Island was the former site of the BHP steelworks, this proposal also presents the risk of mobilising toxic contaminants which are currently bound up in sediment and soils throughout the Kooragang ponds and southern arm of the Hunter River. This contaminant mobilisation could negatively effect the whole estuary ecosystem including a rise in the bioaccumulation of heavy metals in local fish stocks. Too little is known about the true risks to ensure Newcastle communities will be protected from toxic seepage and related accidents. There is no plan as yet to fully remediate the site so as to prevent such events. Lets play it on the safe side! The 4th coal loader proposal’s Environmental Impact Assessment fails to meet the State and Federal requirements and after construction will provide no additional employment. In fact, the likelihood is that it will result in the loss of other economic activities in the port like tourism, fishing and other shipping. Cotton fibres for cloth are produced from the fluff around the seeds of the Cotton plant, Gossypium tilaceae, a member of the Hibiscus family. It needs long growing season for good yields and has high water requirements. Hemp fibres are from the stems of the hemp plant, each fibre is many times the length of a cotton fibre meaning energy saved spinning the fibres into thread.Â Hemp is drought tolerant and can produce good fibre yields without irrigation, particularly useful for this drought-prone country. âWater is a major limiting factor in cotton production within Australia. Over 90% of the cotton grown in Australia is irrigated using some 12% of Australiaâs irrigation water. The majority of cotton is grown in areas where rainfall contributes half the cropâs water requirements.plant, each fibre is many times the length of a cotton fibre meaning energy saved spinning the fibres into thread.Â Hemp is drought tolerant and can produce good fibre yields without irrigation, particularly useful for this drought-prone country. Another problem faced with farming cotton is when ready for harvest it requires a dry period, otherwise is quite prone to rotting and much of the harvest can be lost. With the increasing unpredictability of weather patterns through climate change it may become impractical to continue using cotton as our main fibre source. Conversely, hemp can be left to ‘rot’ in the field in piles for a period of time, the bacteria even helping with the extraction of the fibres from the plant stems (retting process). Hemp fibres being quite rot resistant. Interesting!! Hemp is exceedingly environmentally friendly as it has no major pests and can be grown at a high plant density which out-competes weeds, removing the ‘need’ for herbicides. The average fibre production per hectare is very high in comparison with any other fibres commonly used such as cotton, wool, and flax. Hemp fibres, seeds and other products have a plethora of uses… too many for me to regurgitate here but i’ll add a couple of links to some great in-depth reading on the subject. This business and site is especially impressive and worth the read. Lots of good linked references and data. Of recent I have watched a few documentaries with focus on and around Industrial Agriculture, Food security, Energy security, world ecology and human induced climate change. While I am acutely aware of so many problems in the world I try to remain positive andÂ feel obligated to share a list of a few of these as they cover subjects very pertinent and dire but also rays of hope and realistic solutions. THE RANT: Every year the scientific evidence just keeps building that our way of life is truly unsustainable on a global scale. Economies severely addicted to non-renewable resources such as oil and coal which cause a plethora of environmental problems in both extraction and use. We have the renewable technology, the powers that be just don’t seem to be able to make the leap. Maybe I can inspire an energy revolution in Australia? So many countries classed as ‘the third world’, perhaps strangely named seeing as they are inextricable linked to the other ‘worlds’ by the shared atmosphere, oceans and forests. A shared life-support system if you will… The people of these countries are driven into continued and increasingly drastic environmental degradation simply in an effort to survive. This occurs as the vast majority of the world’s resources and material wealth concentrate with a global minority; namely large corporations and individuals of the “first world”. Living in a first world country I feel privileged in a lot of ways, considering I am in a stable enough situation to be able to address these things instead of the struggle to survive dominating my thoughts. In many other ways I feel guilty/disgusted as I observe many of these trends first hand and have limited power as a sole individual to influence them at the speed they need to be (besides providing inspiration and a good example of the correct path that is).